You want to win your college football bowl pool. There’s no better way to kick off the New Year than collecting the winner’s money and talking some trash to your friends. Entering a bowl pool is easy enough, as you pick the winner in each bowl game straight up. Some pools require confidence points that define the points earned for picking the winner in each game while others weight each game equally. However, bowl games are hard to pick. These games usually feature only strong teams, and the markets pick 63% of the game winners straight up. This article will take you from novice that doesn’t know the difference between Ole and Southern Miss to expert that optimizes your chance to win a bowl pool. This starts with recognizing the value in bowl pools, as the data on how the public picks games reveals inefficiencies. Entering a bowl pool isn’t like betting spreads. Then we’ll get into the type of pool that you should enter. The six digit prize in that thousand person pool might seem enticing, but we need to get real about the effects of randomness. Finally, I’ll discuss the contrarian strategies you will need to win intermediate sized pools. You will identify the mistakes of the public and pick against them to maximize your chances to win. However, these contrarian strategies only work for certain kinds of pools. Confidence points or no? A big aspect of winning your pool is identifying the right one. Hopefully, I’ve caught you before you start getting all those bowl emails from your friends. Let’s dig into my research on how to win your bowl pool. You can listen to the audio version of this article here. Is there any value in bowl pools? If bowl pools were efficient, entrants would pick big favorites at a high rate. For more closely contest games, the teams would get picked closer to 50-50. We can check the efficiency of bowl pools by digging through the pick distribution on Yahoo over the past 4 years. Millions of people pick bowl games on this site, so it gives a good picture of public behavior. In the visual below, I show the fraction of the public that picked the favorite as a function of the closing point spread. The data includes all bowl games from 2013 to 2016. For big favorites, the majority of the public picks these teams, as expected. The line shows the expected win percentage based the point spread, and the public pick rate roughly matches this expectation for spreads greater than 11. However, the public falters on games with smaller point spreads. The visual shows a wide scatter of points around the market expectation for games with point spreads less than 10. For example, consider the Outback Bowl at the end of the 2015 season. 8-4 Tennessee played 10-2 Northwestern, and the public favored the ten win Wildcats. 55% of pool entrants picked Northwestern. However, Tennessee closed as a 9.5 point favorite. The markets had optimism about Butch Jones as he closed out his 3rd year at Tennessee, a short two years before he got fired. Tennessee destroyed Northwestern 45-6, providing a nice win for anyone who took the markets and analytics more seriously than the public. As another example, let’s look at a predicted tight game. In 2013, 9-4 Utah State played 12-1 Northern Illinois in the Poinsettia Bowl. While the record favored Northern Illinois, the markets closed with Utah State as a 2 point favorite. The public seemed to look at record again, as 86% of entrants picked Northern Illinois. Utah State won 21-14. 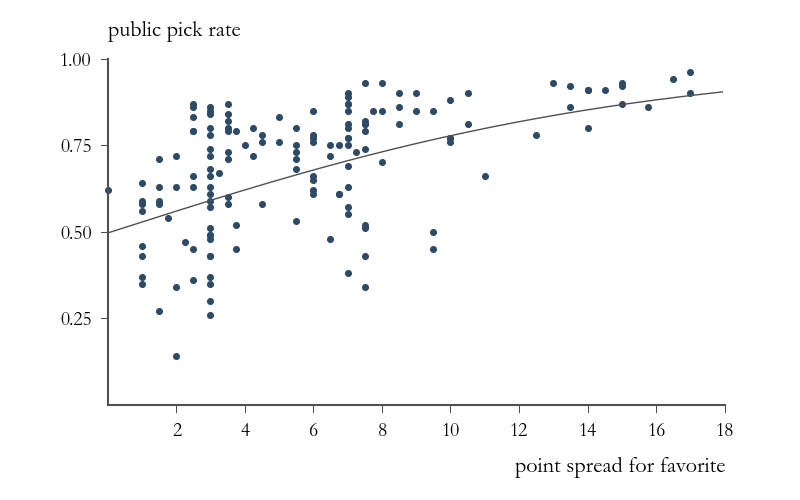 Later in the article, we’ll see how these discrepancies between pick rate and point spread can be used in a contrarian strategy. Do you make this mistake in selecting pools? With the recognition of value in bowl pools, the next step is finding the right pool. While the thousand person pool with a six digit prize pot might seem enticing, I recommend avoiding these contests. To understand why, consider this scenario. Steph Curry walks into a gym full of basketball players hoping to make an NBA team. Feeling kind of cocky, he challenges the players to a three point shooting contest. Beat Steph, and get an NBA rookie contract. Will any player beat Curry, the greatest shooter to ever grace a basketball court? It depends on the number of players that compete. Let assume Steph has a 95% chance to win each contest. It’s unlikely any one player beat him. If Steph only takes on two players, there’s a (0.95 * 0.95), or 90.3% chance that he wins both contests. He has pretty good odds even against players that have excelled in college. However, the more players that challenge him, the more likely someone catches him in a cold streak and beats him. For three contests, the probability he wins them all is 0.95 raised to the third power (equivalent to 0.95 * 0.95 * 0.95), or 81.5%. For 13 contests, Steph has a roughly 50-50 chance to win them all. If he lasts 50 contests, he has a 7.6% chance to win them all. His probability to remain undefeated goes down exponentially, as the math folks like to say. If you use analytics and market data in your bowl pool, you’re like Steph Curry. You have a very good probability to beat an arbitrary pool entrant picking like the general public according to Yahoo. However, a problem arises if you get in a pool too large. The visual shows your win probability as a function of pool size in 2016. I’ve assumed that each game get weighted equally, and you pick the market favorite in each game. Others brackets get picked according to the Yahoo public distribution. Each data point requires 10,000 simulations of bowl season according to the win probability from the markets. Despite playing a solid entry with all favorites, your odds to win a pool drop drastically with the size of the pool. Don’t get in a large pool. Let me repeat that: don’t get in a large pool. No analytics or market data can help you defeat the randomness that comes with these large contests. The last section explained why you don’t want to get in a large pool. Stick with a small pool for the best odds. For example, picking favorites in a 30 person pool gives you a 28.5% chance to win in 2016, a great return on investment. For intermediate sized pools, you might ask whether you can increase your win probability with contrarian strategies. For example, consider a March Madness bracket in which the choice of champion gets the most points. In my book How to Win Your NCAA Tournament Pool, I discuss how you make a contrarian choice by picking a champion that has a decent win probability but is not getting picked by others. For example, Duke was the contrarian choice in 2015. They had a 12% chance to win the tourney by my numbers, but almost no one was picking them as champion in their pools. When they won, you got a large number of points that no one else got. Picking favorites, or chalk, in earlier rounds would earn you enough points to beat the few others that had Duke as champion. By picking a contrarian champion, you reduce the expected value of points in your bracket. Duke’s 12% win probability was small compared to the 36% of Kentucky. However, you increase the variance in points your bracket produces. If Duke wins, you get a positive bump not many others will have. The contrarian choice is a lower expected value, higher variance strategy. In applying this idea to a bowl pool, you need to find a favorite getting picked by the vast majority of the public. The idea is to find a large difference between the public pick percentage and a team’s win probability. For example, in 2016, Oklahoma had a 57.9% win probability over Auburn but 83% of the public were picking the Sooners. While chalk says to pick Oklahoma, the contrarian choice says take Auburn and their 42.1% win probability. The visual shows the win probability for the favorites vs contrarian strategies for pool with no confidence points. 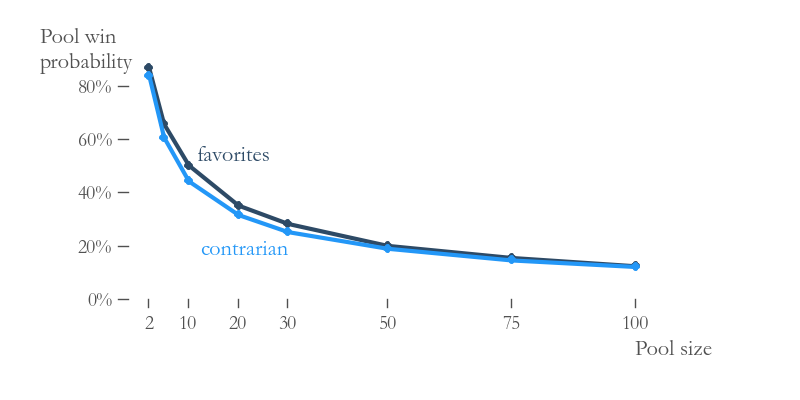 The favorites curve is the same as in the last section. I’ve added a contrarian entry that picks Auburn instead of the favorite Oklahoma and Northwestern instead of the favorite Pittsburgh. The contrarian strategy lowers the win probability for this pool in which each game gets weighted equally. What’s going on here? Let’s think of each game as a coin flip with a weighted coin. 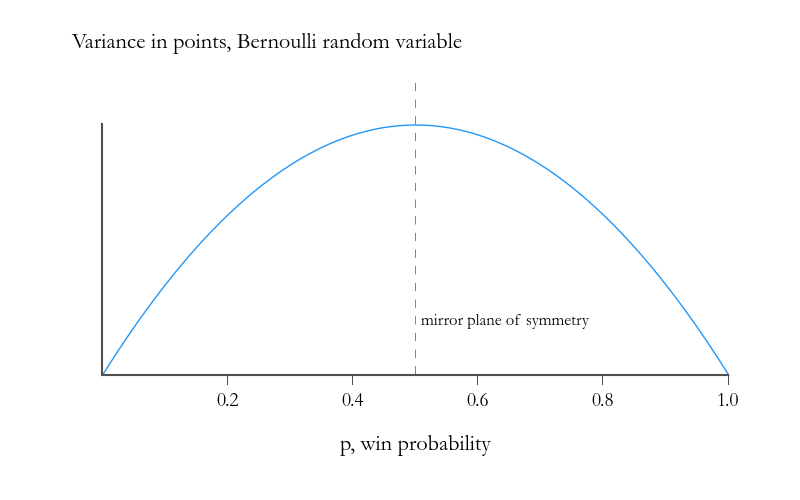 In the math jargon, this is a Bernoulli random variable with a parameter p that gives the win probability for the favorite. The next visual shows the variance for a Bernoulli random variable. For the math inclined folks, the formula is p(1-p). 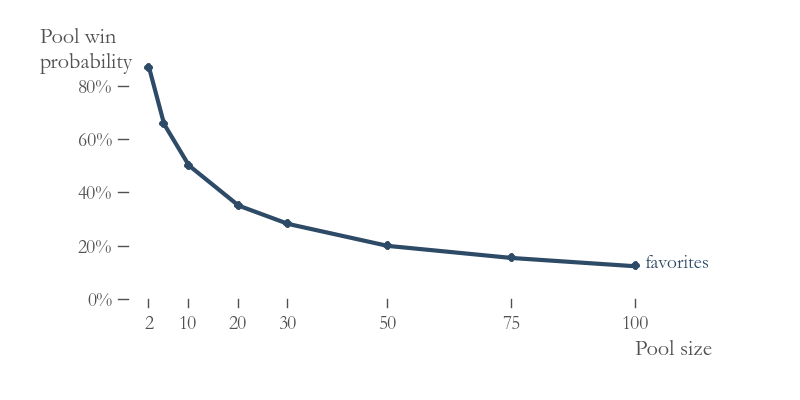 Notice the symmetry of this variance around the value 0.5. The function reflects like a mirror about this line. For the Pittsburgh game, p=0.609 as the win probability for favorite Pittsburgh. When we made the contrarian choice, we picked Northwestern with p=0.391. However, the variance in this game outcome didn’t change. Pittsburgh’s win probability 0.609 is 0.109 from the plane of symmetry, just as Northwestern’s win probability 0.391 is also 0.109 from this plane. In this pool with no confidence points, you are lowering your expected value but not changing the variance. This is why the win probability decreases. Here’s the take home message: you can’t apply contrarian strategies in pools where all games have the same value, or pools with no confidence points. For a pool with confidence points, the variance for a game is the number of points times p(1-p). You can change the variance through the confidence points, so the contrarian strategies will work on these pools. There is value in college football bowl pools. Please don’t get in a large pool. Someone will get lucky and beat you. Contrarian strategies don’t work in pools without confidence points. Get in a pool with confidence points. This advice also applies to weekly NFL pools in which entrants pick the winners of games straight up. To check out the public odds on Yahoo, click here. And remember to know your pool size. If you need a more in depth information on how to win your bowl pool, The Power Rank offers a guide to bowl season that gives confidence points and suggest contrarian games. To check out this package, click here. Is it possible to see a drawn out example of the equation for variance using confidence points? What spots exactly would I be looking for to implment a constrain pick?